Training flights in aircraft fitted with ejector seats similar to the one in which a Red Arrows pilot was killed, have been suspended. The Ministry of Defence (MoD) grounded the flights following the death of Flight Lieutenant Sean Cunningham, 35, at RAF Scampton in Lincolnshire. Other RAF aircraft fitted with MK10 ejector seats are Hawk T1, Tornado and Tucano. The MoD said: "The safety of our crews remains our paramount concern." It added: "All non-essential RAF flying on aircraft fitted with a similar ejector seat to the Hawk T1 has been temporarily suspended." It said the suspension was "pending further investigation and purely as a precautionary measure". The Military Aviation Authority is carrying out an independent inquiry to determine the cause of the accident. Flt Lt Cunningham, who lived in Coventry and attended Nottingham Trent University before joining the airforce in 2000, had flown with the 617 Dambuster Squadron based at Lossiemouth. He was involved in several operational tours over Iraq. Speaking in the House of Commons, Prime Minister David Cameron said: "I'm sure the hearts of everyone in this house go out to the family of the pilot who was killed in this terrible accident and it comes on top of a second accident that happened in the Red Arrows. "This has obviously been a very tragic time for something that the whole country reveres and loves and I know that their home to them in Lincolnshire is extremely important. We must get to the bottom of what happened." Medical teams were called to RAF Scampton, the base of the Red Arrows, after the accident at 11:00 GMT on Tuesday. Group Captain Simon Blake said: "The pilot was ejected from the aircraft whilst the aircraft was on the ground." The suspension affects RAF aircraft fitted with Martin Baker Mk 10 ejection seats, and is expected to last for days rather than weeks. Flt Lt Cunningham was born in Johannesburg, South Africa, and moved to the UK in 1986 at the age of nine. His family issued a statement saying: "Since his childhood Sean had dreamed of flying fast jets in the Royal Air Force; through his hard work and dedication he achieved that dream, and the pinnacle of his career was to fly in the Red Arrows. " The Red Arrows completed their final display of the season in September and were carrying out their winter training at RAF Scampton. The accident came less than three months after another pilot with the Red Arrows aerobatics team, Flt Lt Jon Egging, 33, was killed after an air show in Dorset. 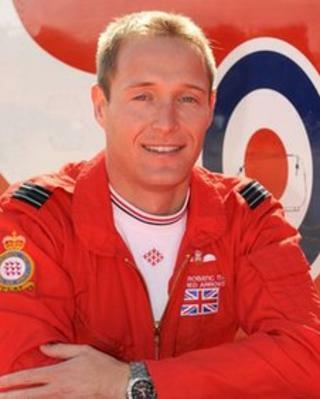 His aircraft crashed on 20 August, after performing a display with the Red Arrows watched by his wife. Flt Lt Egging flew in the Red Four postion, Flt Lt Sean Cunningham was Red Five. The RAF temporarily halted flights on all 126 of its Hawk T1 training jets while preliminary investigations were carried out into the cause of the earlier tragedy. The Red Arrows have used the dual-control BAE Systems Hawk T1, which has a top speed of Mach 1.2, since 1979. Hawk T1s are also used for training fast-jet pilots at RAF Valley in Anglesey, North Wales, and RAF Leeming, near Northallerton, North Yorkshire.